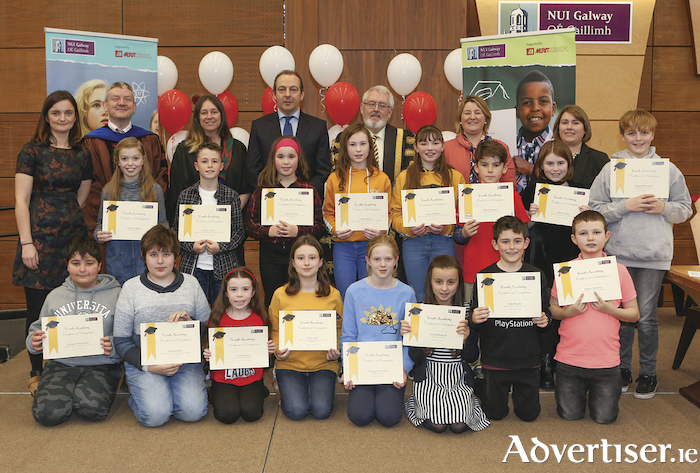 The NUI Galway Youth Academy, an outreach programme aimed at high ability 9-12 year olds recently received a gift of €250,000 over the next six years from Merit Medical. Merit Medical is a leading multi-national medical device company with significant operations in Galway, employing close to 1,000 people. The gift was announced at the recent Youth Academy graduation ceremony which took place at NUI Galway recently. The Youth Academy programme provides children with a taste of university life and the opportunity to study a fun but high level course in a college subject area. The initiative was established by Mary Dempsey (Vice Dean, College of Engineering & Informatics, NUI Galway ), Dr Caroline Heary (School of Psychology, NUI Galway ) and Dr Lorraine McIlrath (Community Knowledge Initiative, NUI Galway ) to enhance the educational potential of children and inspire progression to higher education. Since piloted in 2012, enrolments have grown from 64 participants in its first year to nearly 700 participants per annum. The number of courses on offer has increased 10 fold and 66 per cent of the course are offered in the science, technology, engineering and mathematics subject areas. The reach has expanded beyond Galway with participants often travelling from Mayo, Roscommon, Westmeath, Offaly and Clare for the Saturday morning classes. Mary Dempsey, Senior Lecturer and co-founder of the Youth Academy said a guiding principle of NUI Galway’s Youth Academy programme is to offer 25% of places on a full scholarship basis and provide children and inter-generational families with access to the university campus, its resources and knowledge, and encourage a sense of belonging. Mark Butler, Executive Vice President, European Operations, R&D & Strategy, Merit Medical said that as a worldwide leader in the development, manufacture and distribution of medical devices, Merit Medical are proud to partner with NUI Galway’s Youth Academy programme. "At Merit Medical we believe in children, their fantastic view of the world, their talent, their creativity and passion for innovation. It is important to capture this creativity from a young age, to ignite imagination and power curiosity. "hrough the academy the interest and enthusiasm for STEM subjects and related areas are increased, building the next generation of scientists, engineers and mathematicians. "The Merit Story started with a single idea, build a stronger, safer disposable syringe, from that single idea the next great healthcare company was born. "Today Merit holds over 800 patents and pending applications representing thousands of inventions. So who knows what the future will bring for children graduating from this Youth Academy programme. We are hopeful it will have given participants a broader perspective on all the fantastic opportunities awaiting them in the world of STEM. We encourage them to work harder at school and believe that most things are possible, and you are never too young to think big," he said. Voice Over Casters for ‘Game Of Thrones’ and ‘Love/Hate’ comes to Galway for unique Workshop!